Missing teeth might seem like a simple dental problem. However, if left untreated, the consequences can be devastating. Thanks to modern dentistry, missing teeth can be easily treated with advanced restorative dental procedures such as implant dentistry. Implant dentistry is a revolutionary, permanent solution for missing teeth. Dental Implants, resembling the feel and look of your real teeth, are surgically inserted in the jawbone. 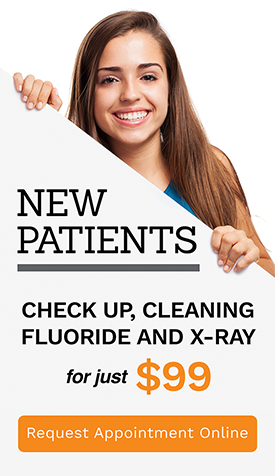 At A Plus Dental, we provide high-quality dental implants in Campbelltown. Our natural-looking and long lasting implants can re-establish your confidence as well as the aesthetics of your smile and facial profile. Dental implants involve an implant post made of biocompatible material such as ceramic or metal, which is designed to replace the root of a missing tooth, and a replacement tooth (dental crown) on top. The implant is surgically attached to the jawbone and acts as foundation for crown, dental bridge, or dentures. To be a good candidate for dental implants, you must have proper bone density, good overall oral health, and a strong immune system to prevent infections. Good oral hygiene habits are also required to help maintain the longevity of the treatment. Dental implants feel natural and look exactly like your biological teeth. They can restore your smile to its original appearance and function. For patients who find dentures or crowns uncomfortable or less appealing, dental implants are an excellent alternative. The implant dentistry procedure requires several visits and months to complete. During the preliminary visit, your dentist will test your bone density to make sure that the jawbone can hold the implant post, and will also take diagnostic impressions of your teeth and jawbone. The second appointment is dedicated to placing the implant in the jawbone. The dentist will numb the area and create a small incision for the implant post. The post is left to heal in the jaw for 4 to 6 months before attaching the permanent synthetic tooth. 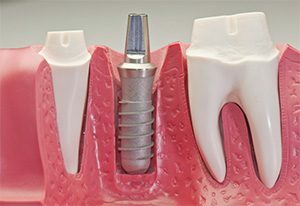 After the integration of the implant with your jawbone, the permanent tooth replacement is attached to the implant post. Suffering with one tooth, or missing teeth, calls for a strong and long-lasting solution such as dental implants. At A Plus Dental, we use premium materials to fabricate strong and natural-looking dental implant restorations that can last for many years. Claim your FREE Dental Implant Consultation today!